JUST RELEASED! 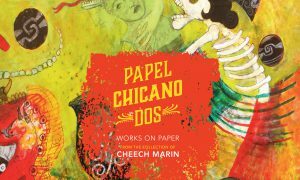 Papel Chicano Dos: Works on Paper from the Cheech Marin Collection is now available for purchase online through Amazon. Dating from late 1980s to present day, the 65 artworks featured in this art book range from watercolor paintings and aquatints to pastel drawings and mixed media. The iconic imagery by the 24 featured artists is influenced by pre-Hispanic symbols, post-revolutionary nationalistic Mexican motifs, the Chicano movement of the 1960s, and contemporary urban culture. While published to accompanying a traveling exhibition with the same name, the book is perfect on its own, with full-page color images and biographical information on the featured artists. ORDER YOUR COPY OF PAPEL CHICANO DOS TODAY! Click the PayPal button above to buy books or visit Amazon to purchase copies. WHOLESALE ORDERS & GROUP SALES: Request rates by clicking HERE. BOOKSIGNING EVENTS: Want a signed book? We’re booking some events in Los Angeles and other cities soon. For an updated list, stay tuned to my website. With your $25 purchase of Papel Chicano Dos, you can also buy a copy of Chicanitas for only $10 more! Meet Cheech Marin during 6:00 PM to 7:00 PM and get your book signed, too! Buy a pre-signed book in advance of the event at ChimMaya Gallery and get VIP treatment! The FIRST 75 people who purchase one or more books receive admittance to an exclusive reception with Cheech and some of the book’s featured artists, including Cici Segura Gonzalez, Margaret Garcia, and Wenceslao Quiroz from 3:00 to 4:00 PM. To order a book in advance, visit the ChimMaya website to qualify for VIP admittance (space limited). Please notify ChimMaya Gallery of your interest in attending the VIP event by sending an email HERE!